Part one of my musings on several odd markers and at least one possible giant lie (yes, another lie) dealing with Rachel Dolezal/Moore's artistic footprint is here and part two is here. Dolezal's artwork can be seen here. In fact, pretty much all the artwork by Dolezal on the Internet is what she has in that website - other than three pieces which have appeared on Ebay after the story broke out. Rachel Dolezal is an award-winning Mixed Media Artist with over 20 exhibitions in 13 states, internationally, and at the United Nations Headquarters. Dolezal completed her Master of Fine Arts at Howard University, where she majored in experimental studio and minored in sculpture. As an artist, writer, curator and art dealer, I have read and reviewed thousands of artists' resumes over the last four decades, and I find it a little odd to discover Dolezal's lack of any significant artistic digital footprint, other than the WaPo one line mention discussed here and the one, single pre-2007 painting discussed here. Additionally, her 2007 work with the UN is discussed here, although it deals mostly with children's work. But where are Dolezal's "20 exhibitions in 13 states"? Why are there no references anywhere to be found? Why doesn't she have the most common of artists' resume anywhere, listing group and solo shows? We know that while at Howard University she showed in a group show at Prince George County's Harmony Hall Regional Center Gallery in the "Fast Forward: Visual Voices 2002" group show curated by Takema M. Robinson, who curiously wrote at the time that "this group of emerging black artists is looking backward with equal speed." Dolezal was still "non Hispanic white" at the time, cough, cough. That's one show and one state; there's zipfuck on the Interwebs that I can find showing Rachel Dolezal or Rachel Moore (her married name while she lived in the DMV) in any other art exhibition (other than her MFA thesis work discussed below), including the "convention centers around the nation" that she apparently exhibited in during her tenure at Howard (1999-2002) where she sold art, "the highest for around $10,000." Her website also has cryptic references to artwork "on tour in Maryland" and also notes that this installation below was "Last exhibited in Washington, DC on Pennsylvania Avenue." 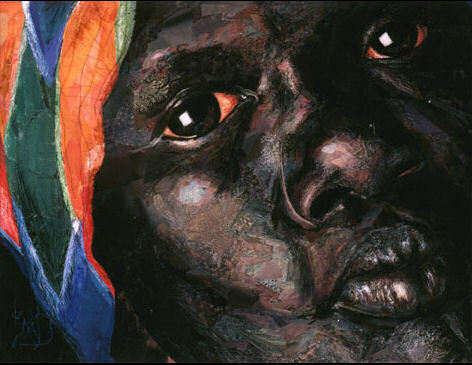 Dolezal’s final thesis was a series of paintings presented from the perspective of a black man and the late Dean Tritobia Benjamin, a formidable scholar whose specialty was black women in the arts, wanted to know how Dolezal felt qualified to tell this type of story as a white woman. So that's two exhibitions. I'm curious to know where this rather complex piece went on tour in Maryland. Whenever an artist puts down in a website trying to sell artwork, that some art is on tour, the next thing that you put down is the venues where that artwork will be exhibited. Twice in her website Dolezal tells us about "art on tour": the aforementioned one "in Maryland" and another tour reference to Mississippi. No idea where and when they were on tour. 9x12 inches - Edition of 12, c. 2007? According to her, this very elegant linocut by Dolezal won the "Mississippi state printmaking award." If you Google that in quotes, nothing but Dolezal comes back. If you remove the quotes, a lot of things come back, none of which I can associate with any state level printmaking award or even Mississippi State University. I'm not really doubting that Dolezal won some sort of award with this excellent print, but why is she so "loose" in her discussion of where, when and what award? You're killing me Rachel! I'm up to about four states (maybe) and the District of Columbia. History: When the original was first shown in Jackson, MS, Jolivette Anderson (aka The Poet Warrior) and the Black Poets' Society performed. 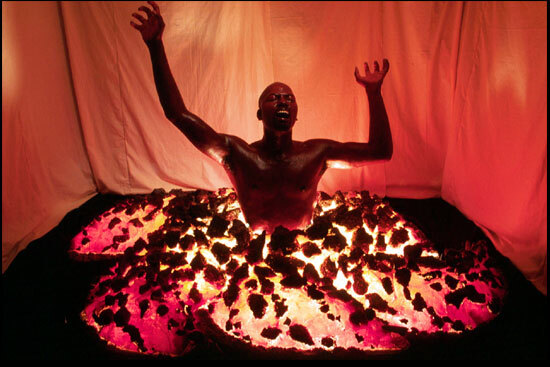 The Poet Warrior wrote "Pieces of You, Pieces of Me," an original poem based on inspiration/connection with this image. That event was a little easier to find; here it is, but documented by the poet herself and then rather recently after Dolezal's deceit surfaced. I think that I'm up to five states plus DC; I could continue to find the remaining states, but you get the point. Why am I being so pedantic? Maybe Rachel Dolezal was just lazy about her artwork documentation, and also documenting it online. But why are there no digital footprints from the galleries or art centers where she exhibited? I'm being pedantic because this immensely talented artist has clearly fabricated a lot of things in her past - not just the racial deception and possibly the hate crimes - and thus, other than her very visible artistic talent, now everything is in question. Update: See what Dave Castillo discovered about the legitimacy of some of her painting here.